The Posh fans team that lost in the final of a major competition. The Peterborough United Supporters team were a penalty shoot out away from winning their first major trophy. The Posh lads took part in the ultra-competitive WorldNet tournament in Preston and finished runners-up in the Plate competition. 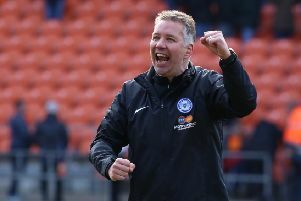 After wins against Grimsby, Runcorn and Bury, Posh were held to a 0-0 draw in the final by Morecamble before losing 4-2 on penalties. “We gave it everything we had,” manager Rob Graves stated. “But we just couldn’t quite push it over the line in the final against Morecombe who had a couple of quality players. “All the lads were great, but our player of the tournament was Ian Walker. Walker, who played for Crowland in the Peterborough Premier Division last season, scored twice as Posh beat Grimsby 2-0 in their opening game of the tournament, but defeats against AFC Wimbledon and Preston condemned them to a place in the Plate competition rather than the main event, which was eventually won by Preston. Posh beat Bury in their Plate semi-final thanks to a golden goal in extra time from Charlie Bosett following a 1-1 draw. Youngster Bosset was the team’s top scorer alongside Walker with four goals. The team also played a handful of friendlies after they’d been knocked out of the main draw. They selected positions for those games using a deck of cards! PUSFC results: Main draw: beat Grimsby 2-0 (Walker 2), lost 0-1 to AFC Wimbledon, lost 0-1 to Preston. Plate: beat Grimsby 2-1 (Walker, Chris Green); beat Runcorn 2-1 (Walker, Charlie Bosett); beat Bury 2-1 (Bosett 2), with a golden goal. Plate Final: Lost to Morecambe 4-2 on penalties after a 0-0 draw. Friendlies: Drew 1-1 with Barnsley (Bosett), lost 1-4 to Stevenage (Lee Hartley), lost 2-3 to Sheffield United (James Mortlock, Bosett). The WorldNet tournament is the biggest in the world for fans’ teams. It’s organised by the Inernet Fans Association for football supporters who belong to internet mailing lists, websites and message boards. This Posh team play a series of Saturday morning matches throughout the season, usually to co-incide with the opposition facing the real Posh team. Last season they also played against local rivals Cambridge United on a home and away basis.